Mass Teddy had died and Mabel’s sister, Dorcas Speid had also died at Southfield. Some of the ‘Southfield Hodgson’s’ were now living at Langley, Oldbury. Cecil’s nephew, Valdie had married his partner Rhema Clarke. Cecil Hodgson had been lodging for about four years now and was about to meet his future wife…. He made an acquaintance with a Jamaican man named Hugh Clark who lived in West Bromwich. Hugh was married to a Jamaican girl, Maud Kirkpatrick. She had a sister, Helen Frances Kirkpatrick, who was residing about 100 miles away at Cardiff in Wales. Helen, affectionately known as ‘Miss Ellen’ was born 1920 at Falmouth in the parish of Trelawny, Jamaica, where she lived with her parent’s Joseph and Muriel. She was one of the eldest of about six children. After the premature death of her mother in 1933 and then her father in 1935, she went to live with her Uncle, the Reverend T.J. Gallimore, a Jamaican Baptist Minister. 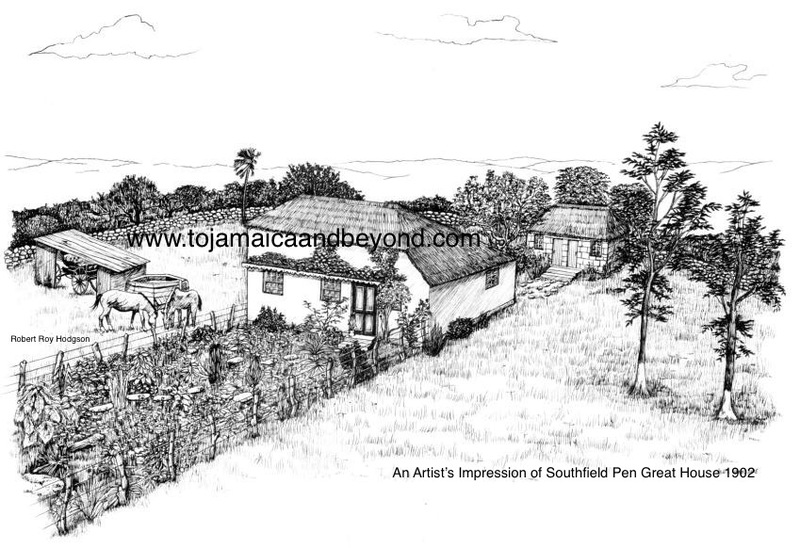 About 1951-2, Helen left Jamaica to go the United Kingdom. Travelling conditions were not good, she boarded a ‘banana boat’ a ship that contained both passengers and banana’s, spending two long weeks sailing on the rough high seas. After arrival in the U.K, Helen was in Wales and enrolled into a Cardiff College to learn the profession of nursing. It took her five years to gain her nursing qualifications there. She resided at Tiger Bay, where it is said she was baby sitter to a black teenage girl named Shirley Veronica Bassey. This young lady eventually went on to become the world-famous Welsh singer, Dame Shirley Bassey! Helen would travel from Tiger Bay, Cardiff to the Midlands to visit her much younger sister, Maud and brother-in-law, Hugh at West Bromwich. It was by way of one of these visits that Hugh Clark, introduced Cecil & Helen to each other for the first time. Having gained her qualifications, Helen soon left Wales altogether, moving to Langley to be with her new partner Cecil, both of them residing together in the same lodging house at Bloxcidge Street. Bloxcidge Street was full to breaking point, having around 30 people living there, Cassie Duncan, the owner, one night angrily stormed into my dad’s room during the early morning, demanding that he leave, because he had not cleaned the kitchen. By March 1957, Cecil and Helen married at West Bromwich Baptist Church, an old Victorian building in Tantany Lane, West Bromwich. My dad was not in attendance at his Uncle’s wedding. An interesting snippet is that my parent’s would later buy a house in Tantany Lane, where Cecil and Helen had married. The old West Bromwich Baptist Church no longer exists in that street today. Cecil & Helen had married quite late in life, he being 46 years of age, she 37. Although Helen was nine years younger than Cecil, there would sadly be no children born to their marriage. Such a shame. Cecil now needed his own home. There was a house for sale in the town of West Bromwich, at Jesson Street. As a black foreigner in England though, it was very difficult for Cecil to get a cheap mortgage for a property, however he managed to use the services of a Jamaican man who had set up helping to provide mortgages for black people. The repayment rates though were very high. The Jamaican man who provided the funding for Cecil’s mortgage was his former Edgbaston landlord of Rotton Park Road, Frank Holdsworth. The mortgage was expensive with very high interest rates, but could be affordable if Cecil rented out some of his rooms. In the June or July of 1957, Cecil and his new wife Helen then left Langley and moved into their new home, 28 Jesson Street, West Bromwich. It was 1957. The establishment of the ‘West Bromwich Hodgson’s’ had now begun. Valdie and his new wife Rhema moved in with Cecil and Helen at Jesson Street, as did my mom and dad, who were unmarried at that time. There were many other people lodging in Cecil’s home too, including family and non family members, each paying Cecil £2 a week rent. Not only did this give his fellow Jamaican’s the much-needed accommodation they craved, it also provided Cecil with the extra funds needed to pay his expensive mortgage. More Hodgson’s would now soon emigrate from Jamaica to West Bromwich…. Cecil, Valdie and Rennie, all continued to travel the few miles to their respective workplaces, Albion Bottle and Tube Products, Langley, Oldbury. Dad and mom were residing at the lodging house of a Mr Morris, 25 Century Road, Oldbury when they got married on the 26th October 1957 at Oldbury Town Hall Registry Office, Worcestershire. His brother Valdie, who had also married at the same venue the previous year, was his best man. Newly Weds, Helen And Cecil, At Their West Bromwich Home. Note The Wedding Ring! This has been another interesting blog for me to write. Mom & dad, Uncle Cecil & Aunt Helen marrying in the same year. The settlement of the Hodgson’s in my birth town of West Bromwich invoked warm childhood memories of me and my brother’s and sister’s regulary visiting Uncle Cecil and Aunt Helen at their Jesson Street home while I was a small boy in the 1960’s. Hope you have enjoyed reading my latest blog 1957 – West Bromwich. Thank you, it’s so interesting to read.